Marketplace Chaplains has long highlighted the fast-growing trend of workplace chaplains, but this weekend's Super Bowl 50 between Denver and Carolina, seen by 100 million people, will showcase the league-wide NFL trend of Super Bowl Chaplains for each of the 32 teams including the two playing for the ultimate 2016 championship. 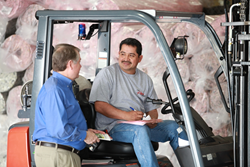 Marketplace Chaplains employee Paul Shirley talks with a Rasa Floors employee on his forklift during a regular Marketplace Chaplains visit. Marketplace Chaplains, America’s largest and original workplace chaplaincy organization, has long highlighted a growing workplace trend as several hundred companies in North America are providing workplace chaplains with the support of strong company leadership. But the Carolina Panthers, strong favorites in this weekend’s Super Bowl 50 in the sunny San Francisco Bay Area are showcasing another league wide trend. For Carolina and the majority of NFL teams, including their Sunday opponent Denver Broncos, it’s use of a workplace team chaplains supported by the team owner. All 32 NFL teams have a chaplain on their staff, either as a full or part-time member, or in a voluntary capacity from athlete service organization, Athletes in Action. Panther team Chaplain Mike Bunkley, a former college running back, has been with the Panthers since the team started in 1995. Panther’s owner Jerry Richardson, in the past, has publicly spoken about the importance of a personal faith in his life. While not in the overpowering media spotlight of one of the world’s biggest sport events this week, Marketplace Chaplains work with a wide variety of employees on a voluntary, confidential basis. Currently, Marketplace has nearly 2,000 chaplains serving in over 3,668 company locations, helping over 624,003 employees and their family members. “We had some people wonder what would happen when we started the chaplain program, but now our employees would be in an uproar if we tried to take it away,” said Steve Luse, CEO of The Luse Companies, located outside of Chicago. Regardless if the Panthers win or lose in pro football’s ultimate game, Bunkley said his role is to help in the joys and problems of their life. The same can be said for Marketplace Chaplains. For more information on this unique employee benefit which has been featured with Marketplace Chaplains on CNN, NBC Nightly News, and in the Washington Post, the New York Times and Bloomberg BusinessWeek, visit http://www.mchapusa.com. To arrange an interview with a Marketplace Chaplain contact Art Stricklin, Vice President Public Relations, at artstricklin(at)mchapusa(dot)com or call 1-800-775-4400.